When I was a young, precocious thing, I was enchanted with my Grandma’s pink, fairytale sanctuary otherwise known as her bathroom. My grandma didn’t call this magical room the “bathroom.” She called it the “powder room.” And she wasn’t fooling around with the powder part. Her bathroom counters were always immaculately sterile except for one small, pink canister containing white powder and the softest, fluffiest puff applicator. My sister and I had loads of fun blowing big clouds of magical pixie dust into the air hoping to become matte goddesses. We would walk into the bathroom squeaky clean and come out with our faces starched so tightly we could barely crack a smile. 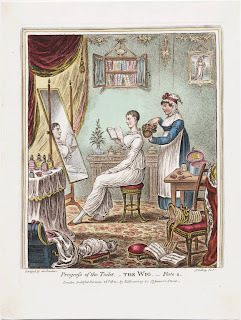 The powder room has lost its place in the world today, but if you were to go back 200 years, powder was serious business. In fact, you would have had a hard time finding an aristocrat who didn’t walk down the street with a cloud of powder trailing behind their towering head. 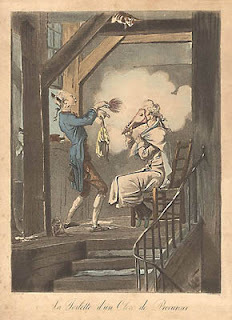 Powdering a wig was typically much easier because it could be done off the head, but if you wanted your own locks blended into the wig or wanted to powder your own hair…well better sit back and grab a baguette. You are in for a long process. Your valet would first bring you into a special room designed specifically just for powdering called the wig closet or powder closet. 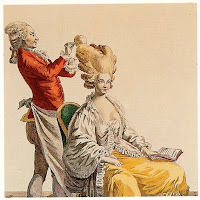 Next, he would plaster your hair with grease, (usually bear grease) or if you were wealthy enough, pomatum. Pomatum was a scented paste typically composed of mutton suet and lard. Yum. Sound appetizing? Well if you were a rat you would certainly think so. Hair became so infested with rodents that beauty books contained special vinegar recipes to rid hair of vermin. We think we suffer for beauty? 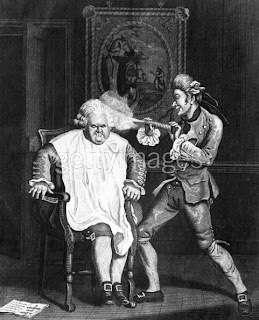 Imagine having to dig a rat out of your enormous coif just to get great hair. Not everyone could afford pomatum either. 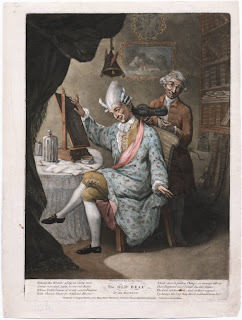 British sailors were forced to use tar to keep their wigs in place. I can't imagine how they got it out. You had a number of color options too for powder. It was usually white or grey but sometimes brown, black or blond was used and for a brief time, pink, blue and lavender power became all the rage. Unfortunately, this whole process didn’t always work so well, so you could count on having to spend another session in the powder room before the day was done. And that was just the powder for your hair. Powder was also used in cosmetics...but that is a post for another day. Pointer, Sally, The Artifice of Beauty: A History and Practical Guide to Perfumes and Cosmetics, UK: Sutton Publishing, 2005. Sherrow, Victoria. The Encyclopedia of Hair: A Cultural History,Westport, Conn. : Greenwood Press, 2006. Bryer, Robin. The history of hair : fashion and fantasy down the ages, London : Philip Wilson ; Wappinger Falls, N.Y. : Distributed in the USA and Canada by Antique Collectors' Club, 2000. Corson, Richard. Fashions in Hair, London : P. Owen, 1980. Can you imagine how they must have itched?? ?Wow, I can not imagine having to do this every day....great post!!! You've answered all my questions re: how-tos without my having to ask them! Perfect timing -- thank you!! Its funny how hair regimen tends to evolve through the years..However, in relation to the hairstyles evolution comes the problem of hair loss in both men and women.But this can be prevented with the right choice of solution.